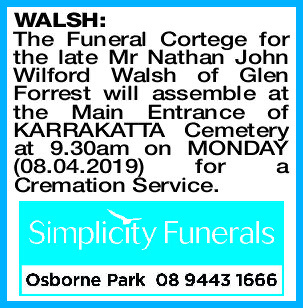 The Funeral Cortege for the late Mr Nathan John Wilford Walsh of Glen Forrest will assemble at the Main Entrance of KARRAKATTA Cemetery at 9.30am on MONDAY (08.04.2019) for a Cremation Service. 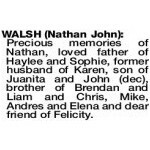 Precious memories of Nathan, loved father of Haylee and Sophie, former husband of Karen, son of Juanita and John (dec), brother of Brendan and Liam and Chris, Mike, Andres and Elena and dear friend of Felicity. 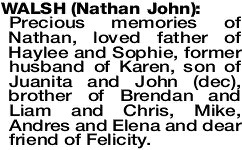 Dearly loved brother and uncle. 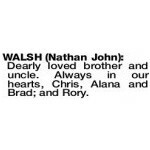 Always in our hearts, Chris, Alana and Brad; and Rory. 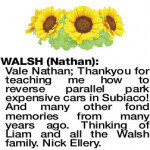 WALSH NATHAN Vale Nathan; Thankyou for teaching me how to reverse parallel park expensive cars in Subiaco! And many other fond memories from many years ago. 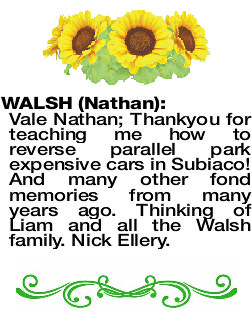 Thinking of Liam and all the Walsh family. Nick Ellery.